Santa Monica Press, 9781595800114, 183pp. This is a collection of courtroom illustrations from the most talked about trials of the last 25 years, coupled with insider observations and case summaries. 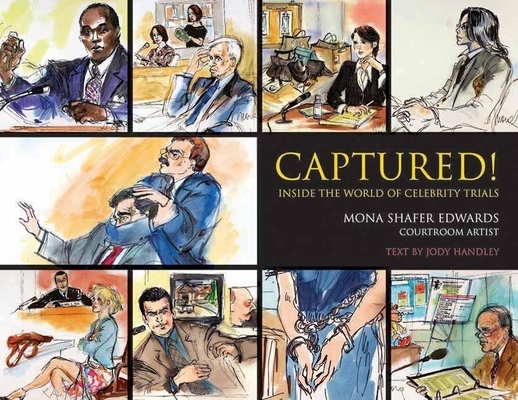 Mona Shafer Edwards is a courtroom artist whose illustrations have been featured on programs and networks such as 20/20, A&E Biography, ABC, CNN, and Entertainment Tonight, and in numerous publications, including Entertainment Weekly, Los Angeles Times, and Newsweek. Edwards has also created feature film storyboards and sketch art for such films as Moulin Rouge and has taught fashion sketching classes at U.C.L.A. and other academic institutions. Jody Handley is an editorial consultant and a former editor for Warner Books. A playwright, she also serves as Producing Director of the Playwrights' Center of San Francisco.